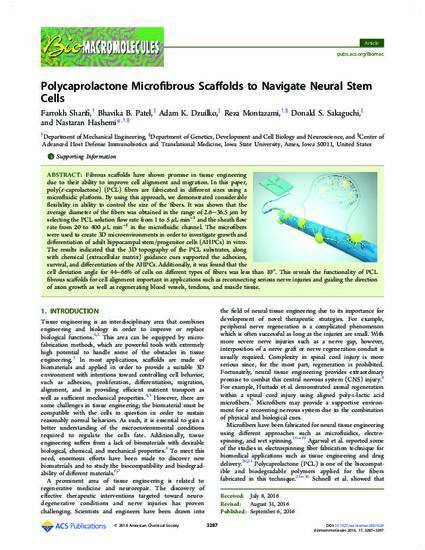 Fibrous scaffolds have shown promise in tissue engineering due to their ability to improve cell alignment and migration. In this paper, poly(ε-caprolactone) (PCL) fibers are fabricated in different sizes using a microfluidic platform. By using this approach, we demonstrated considerable flexibility in ability to control the size of the fibers. It was shown that the average diameter of the fibers was obtained in the range of 2.6–36.5 μm by selecting the PCL solution flow rate from 1 to 5 μL min–1 and the sheath flow rate from 20 to 400 μL min–1 in the microfluidic channel. The microfibers were used to create 3D microenvironments in order to investigate growth and differentiation of adult hippocampal stem/progenitor cells (AHPCs) in vitro. The results indicated that the 3D topography of the PCL substrates, along with chemical (extracellular matrix) guidance cues supported the adhesion, survival, and differentiation of the AHPCs. Additionally, it was found that the cell deviation angle for 44–66% of cells on different types of fibers was less than 10°. This reveals the functionality of PCL fibrous scaffolds for cell alignment important in applications such as reconnecting serious nerve injuries and guiding the direction of axon growth as well as regenerating blood vessels, tendons, and muscle tissue. This article is from Biomacromolecules 17 (2016): 3287, doi: 10.1021/acs.biomac.6b01028. Posted with permission.